Happy Friday everyone!!! I want to thank you all so much for your well wishes on our launch event!! Everything was beyond perfect and it was even more than we had hoped. It just so happened that my parents were going to be here for Mother's Day and obviously having the event while they were in town was the best coincidence! This has been quite the week around here because you'll also notice that this little space got a little face-lift!! I hope you like it! 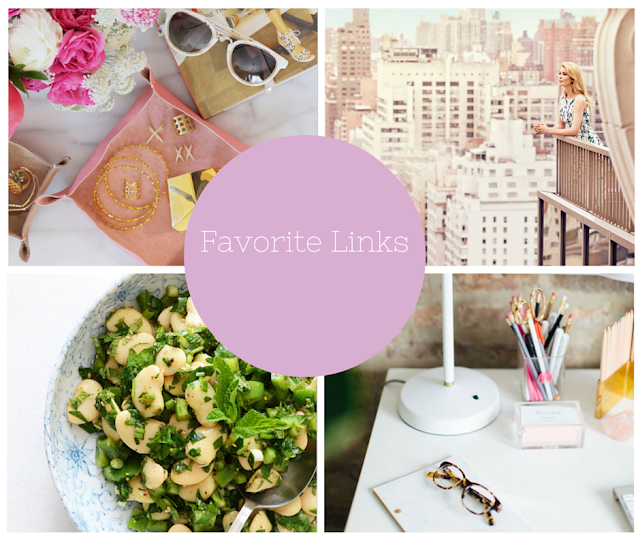 I'm linking up with Amanda and April to share even more favorites from the week! So I don't have a waffle iron, but after finding these Zucchini Parmesan waffles I really need to get one!! How amazing do these look? Even though I don't plan on hosting a party for a while, this Citrus Centerpiece is pretty genius! If you're new to self tanning like me, then you probably are afraid of turning orange!! Well Jaclyn Hill posted an awesome self tanning how-to video and I've watched it like 10 times trying to make sure the next time I self tan at home - I perfect it!! I stumbled upon this instagram photo the other day and I just fell in love with the nails!! I have short ones and I just think the design is so fun!! I hope you all have an amazing weekend and see you back here on Monday - I'll share pictures from the event as well! YAY!!! I am SO happy for you that the event went perfect! I knew it would! :) Ok, those waffles look amazing! YUM! And loving those pretty blue nails! And those spring/summer salads are definitely going to become my new lunch go-to! Happy Friday doll! 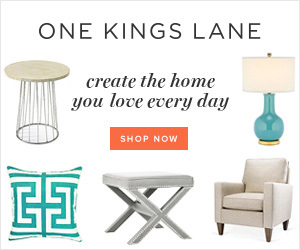 Oh, obsessing over your new blog header! That font is SO pretty!!!! Beautiful blog make over! I mentioned the post you did on your mom on my favorites post today and linked you up! So glad your evening was a success! Now go celebrate this weekend my dear!!!! I was mentally ticking off all of the things I loved and wanted to comment on, but I loved them all! AND the facelift! It looks so clean and pretty! SO glad to hear that your event went well! I was sending positive vibes your way last night :) Have a great weekend with your parents! Congratulations on a successful launch Biana! Isn't Jaclyn Hill Amazing? I just love her! Have a great weekend. I am loving this Friday round-up! The Zucchini Parmesan Waffles look amazing and I will definitely need to check out the sunless tanning YouTube video -- I'm in desperate need of color haha! Happy Friday and have a wonderful weekend! I'm so happy your launch was a success! I knew it would be! And love the facelift! Have a fabulous wknd, girlie! Ok, your blog design - GORGEOUS! You will kill it this weekend & I'm soo glad your parents will be there to share it with you!! The blog looks absolutely amazing! Love how it turned out! Hope you have a wonderful weekend with your fam and I'm so glad the launch was successful -- no surprise there! Yayyyy for the event going so well, and how awesome that your parents were in town for it. Can't wait to hear all about it and see pics of how gorgeous everything looked. That zucchini waffle looks so tasty! And thanks for that salad link because I love making fresh and different salads for the spring/summer! So glad the event went well and how great your parents could be there! I love that centerpiece and yay for this fun facelift! Congrats on your first event!! Loving the sites new look. It is perfect. I didn't know Julianne had a blog, thanks for filling me in! Oh and I'm in love with that citrus centerpiece!! So pretty! xo Happy weekend! Enjoy the time with your parents!! Yay! So glad it went well!!! Love that centerpiece so much. Have a great weekend girl! so so great to hear your launch event went well!!! that's no surprise though! loving that recipe and that self tanner tutorial. i mean - who doesn't need help with that? fake tans are the way to go! happy friday love! I'm so glad you event went well! That citrus centerpiece is so cool. I love it. Your page looks great! It's fun to get a new look. Loving the new design!! So pretty! So happy everything went wonderfully last night! Those waffles look amazing! And I'm so in love with those nails! I've been wanting to try the little strips but I heard they peel off easily :( I hope you have a great weekend! Oh my goodness those waffles look amazing. Pinning that recipe asap! Love the updated look as well! I have a waffle Iron and I may need to make this! I love the centerpiece! Beautiful! Your blog looks fantastic!! Love the new look. So happy to hear that your event went well. Sorry that I was unable to make it. Hope you have a wonderful weekend with your parents. How fab that you get to spend Mother's Day with your mother. I have not tried sunless tanning since my freshman year of college because I felt like after the use of one whole bottle my skin had not changed more than one shade! I need to try again with some higher quality stuff! I LOVE the new details to your blog! So pretty! And congrats on a successful night last night! You totally deserve it! Enjoy your weekend with your parents!! Oh now I need a waffle maker ;) so thanks for that. Ha! Caleb and I could totally use a "catch-all" for keys and phones and wallets. I need to look into that! Have a good weekend girl! So happy to hear the launch went so amazing!!! Oh yum, I am so making those waffles! Homemade waffles are the best, you must get a waffle iron! Congrats on the awesome event! I loved seeing the sneak peek pictures on Instagram - everything looked amazing! Loving your new header too. Happy weekend! Great links! Glad your event went so well, that's very exciting! And the new site looks great! I love your new blog look! The colors are gorgeous! So glad your event went well! Love the new blog look and cannot wait to see pictures from your event - glad to hear it went well!! Love your Friday favorites Biana. That recipe - oh my. I love the mint nails with the black stripe, also. Happy Weekend celebrating the mothers in your life, Biana! <3 Ada. Beautiful new layout! I think I need a waffle iron asap! Can't wait to check out that self tannin video too! I use the St. Tropez foam with the mit applicator and it goes on really well and easy, but I'm always up for advise on how I can improve! Glad that your launch event went well! I'm hesitant to try sunless tanners, however Jaclyn's video was extremely helpful. Maybe I'll give a whirl! Have a great weekend, glad to hear your event went well! Love the new design!! Erin does great work! And so happy to hear your event went fabulous last night, even better that your parents could be there! :) Happy weekend! That citrus centerpiece is the cutest! Congrats on a great event and awesome that your folks were able to share the experience with you!! I don't own a waffle iron either but the zucchini waffles sound amazing! 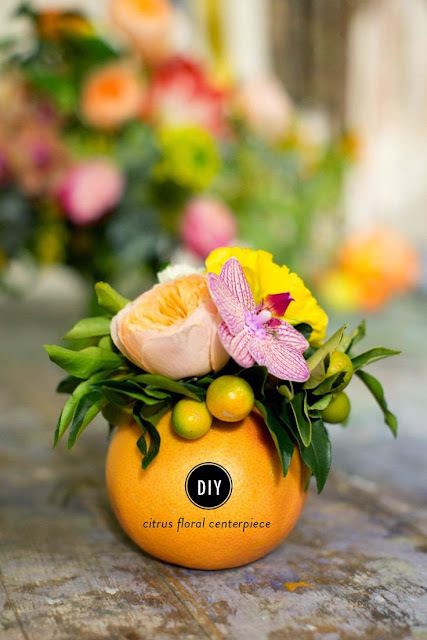 Those citrus centerpieces are perfect for a tropical themed wedding or party! Have a great weekend lady!! Jaclyn is such a doll and her tutorials are always perfection! Those zucchini waffles look bomb! It's amazing what you can do with a waffle iron. I'm totally trying this. Have a great weekend! Yay! So glad it went well!!!! And to have your parents there for support I'm sure was so great! That centerpiece is adorable! Loooooks amazing, lady! Loving the new look, it is soooooo you and beautiful. So glad last night went well, I was thinking of you :)! Absolutely love the new design! So crisp and feminine. Jaclyn Hill is one of my absolute favorite You-Tubers! I'm so glad your event went well and how special that your parents got to attend! Happy Friday lovey! I hope you have a wonderful Mother's Day with your Mama! Absolutely loving the face-lift! Also that waffle looks extra super delish. It makes me want to buy a waffle iron just to make it! I'm also so glad to hear that the launch event went well, that's so exciting! So happy to hear that the launch went well and can't wait to see pictures! Ooh can't wait to see the launch pics-- and love the new look of the site… so fresH!! I need to update mine as well!! good to hear that your event went well!! and now i want a waffle maker lol. Love Jaclyn Hill and her videos and your site is looking great! Love, love love Jaclyn Hill and that sunless tanning routine... talk about a life saver! Those waffles sound delicious and I am in love with that citrus centerpiece! Enjoy your weekend! The Spring/Summer salad link looks wonderful - thanks for sharing! Can't wait to try some! 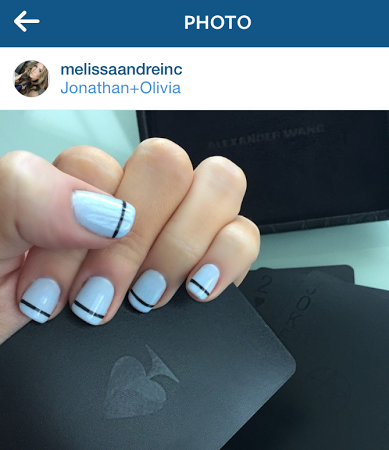 I love those nails, such a cute design! Love those links! Also, that first recipe looks so delicious! Those centerpieces!! If only I could insert an emoji with heart eyes here! I love those nails, and that citrus centerpiece! I love that diy project, so pretty and cute, have a great weekend! Ok the self-tanning lady looks like a completely different person, holy moly! I've been looking for a cute catchall diy, so thanks for sharing! Oh, boy! I must try those waffles! Ahh, the citrus centerpiece really is genius, love it! 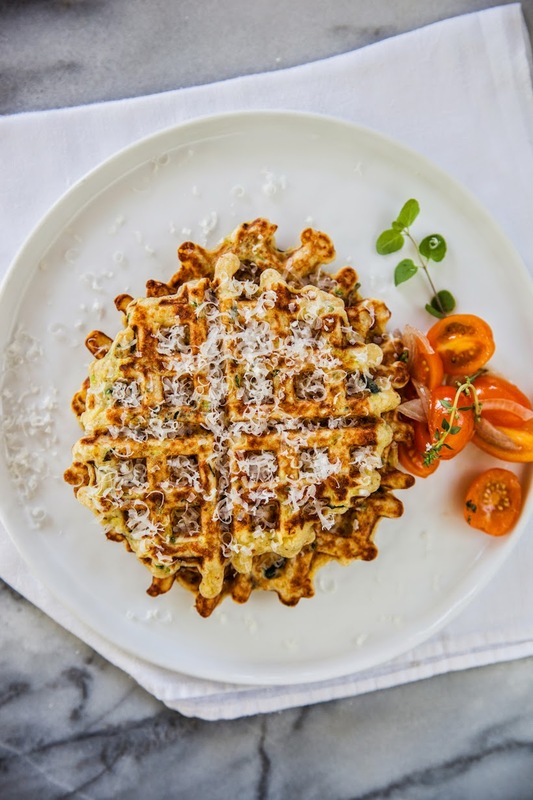 Zucchini parmesan waffles?! SIGN ME UP! I watched that entire tanning tutorial... what a GREAT idea to use a makeup brush! I'm gonna try that! I never would've thought of it but it makes so much sense! Hooray! I'm so happy to hear that your event went well. Your new site design looks fantastic, too! Loving all your picks this week - I seriously have a girl crush on Ivanka Trump. I hope you had a good weekend! such a fun post! those waffles look so dang good! love those waffles! that is just the best idea! love that centerpieve too! adorable. i've done that nail tutorial before but never in pastels---so pretty! Wait, what is that waffle! Yum! The nails look super pretty and a fun Spring/Summer color! That citrus centerpiece is SO cute!